In full disclosure, I saw Genius Recipes’s “J. Kenji López-Alt’s Ten Minute Lime Cracker Pie” on the food52.com website, and my mouth started watering. 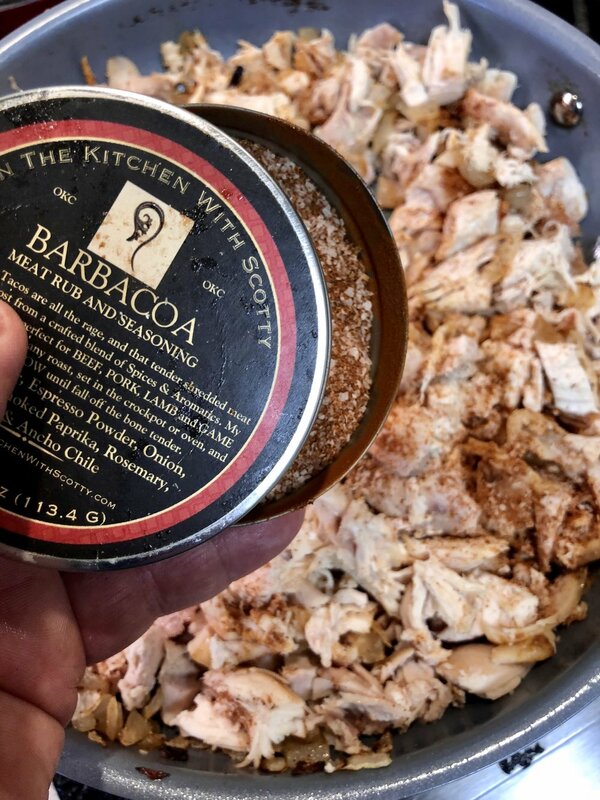 Yes, there’s a lot of name dropping going on right now, but as much as I like credit for my recipes being given (and you know who you are) I think it only proper to give credit where credit is due when I see and present a recipe I have found for you guys. 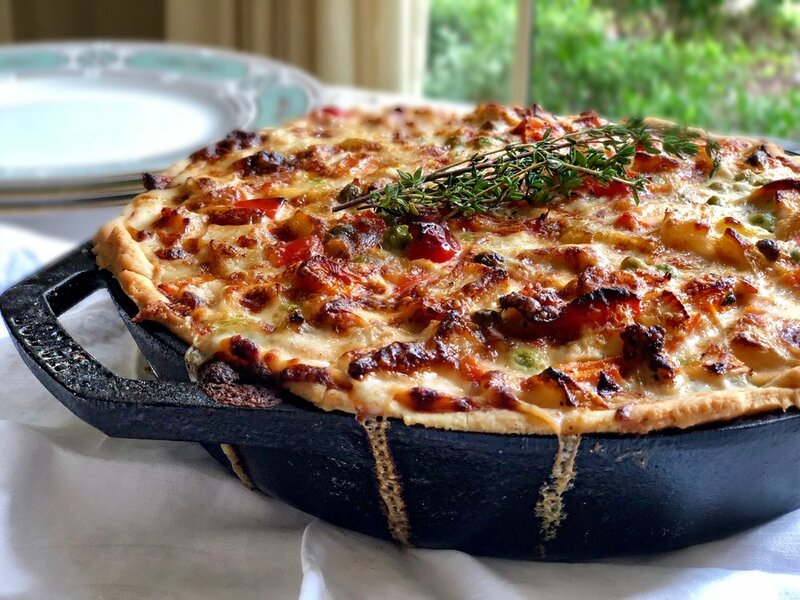 Now, I did change some few minor details to meet my likes, and I fully expect you to do the same when it comes to my recipes. So icebox cakes can be anything you want them to be, and along as there is a cookie or cracker layer, along with a cream-custard- or curd layer. 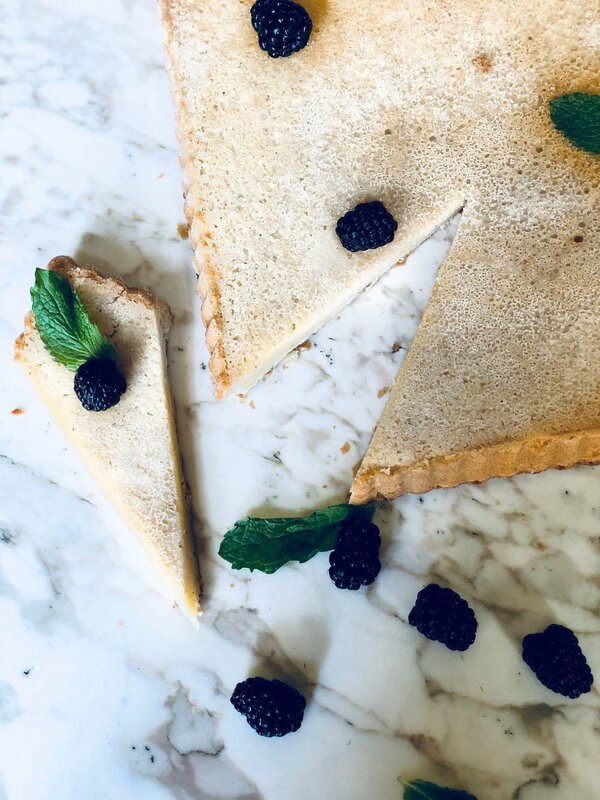 I have made two other icebox cakes before (just do a search on my website) and they are not only easy to make but deliciously light and flavorful as well. The fun component in this recipe is using RITZ brand crackers for the “cookie” portion of this icebox pie. Club Crackers would also be a great choice… Maybe saltines if I were doing an icebox pie with caramel for a “salted caramel” option. Anyway, check this out and get ready for something delicious. I changed a few amounts, used key limes instead of regular limes which you may also do. In the middle of making I thought a pink grapefruit version would be nice as well… I’ll have to try that with Club Crackers! Add the fresh key lime juice and watch the mixture thicken! In a large mixing bowl and using a hand whisk, pour in the heavy whipping cream followed with the three cans of sweetened condensed milk. Mix thoroughly to combine. Pour in the key lime juice, along with 1 teaspoon of key lime zest, slowly while mixing. You will notice the mixture starts to thicken … this is a good thing. Mix all of the juice in and mix well. 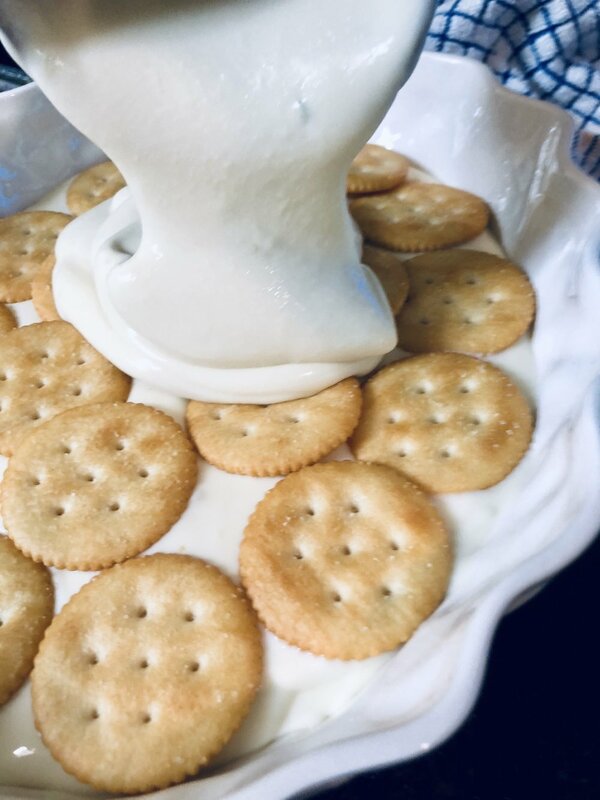 In the bottom of a deep dish pie plate, or some sort of deep high sided dish that you can layer in crackers and cream, add a layer of the Ritz crackers. Remember the more crackers you add, and the longer this icebox pie sets, the more layering of soft “cake-like” layers you will have. After a layer of crackers, add a cup or two of the key lime cream. Add a layer of crackers on top of that, and continue the process until you’re out of cream. Make sure each cream later is smooth and even, reaching all sides and corners. End with the last layer, the top layer, being the key lime cream. Sprinkle the top with the last teaspoon of key lime zest. Over the dish with plastic wrap, and chill in the refrigerator at least three hours. Overnight is ideal for a more cake-like ending. Serve by scooping or cutting out a piece of the icebox cake. Dip any remaining Ritz crackers in melted bittersweet chocolate for a key lime-chocolate treat, and present on top as a garnish to this icebox cake! Enjoy! 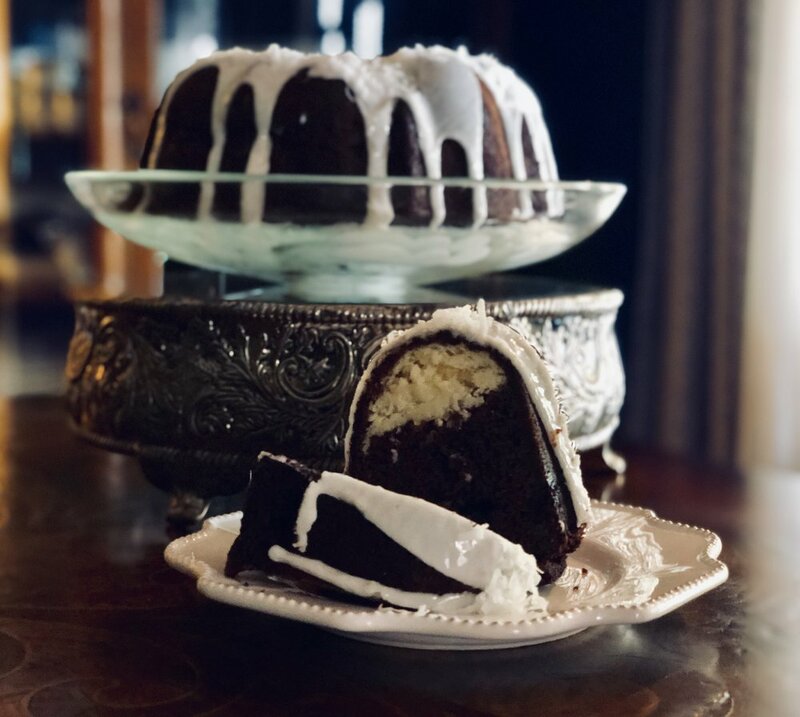 CHOCOLATE-COCONUT TUNNEL CAKE: The Ultimate "Mom Cake"
Growing up, my mother worked as a REGISTERED (we always had to say “registered” first) Medical Technologist at a clinic in my hometown of Sapulpa, Oklahoma. For the first ten or so years of working there, it was the medical clinic of Dr’s Thomas Burnett and Walter Cale. Drs. Burnett and Cale never seemed to age! I mean to 4, 7, or 10-year-old boy they always looked like old men, with their deep smile lines and white hair, but they never seemed to get any older, the older I got… always looking the same as the years went by. Dr. Burnett was fast in his doctorly gate walking up and down the clinic’s hallways and always seemed to have a "pep" about him. I bet as a younger man he was the guy at parties dancing the jitterbug or Lindy Hop, charming the girls with his quick wit and personality. I remember his personal office on his side of the clinic had bright blue shag carpeting and always smelled like pipe tobacco. Dr. Cale was more reserved. Quieter, more thoughtful in processing diagnosis. He had super soft hands and loved collecting Native American art. The art hung in his examination rooms next to that long stiff examination bed thing. You know the one with the stiff yet thin paper covering that was ripped off and then fresh layer rolled out for the next patient. Mom’s area was the “Laboratory”, and that’s what it kind of looked like inside. Beakers and test tubes, wind up timers and centrifuges, Petri dishes with auger-auger to grow bacteria, and of course, a microscope to look at slides of blood so she could count white and red blood cells. There was also this long beat up cone-shaped bunsen burner that I thought was cool…Okay now that I think about it, it was a little creepy. The Lab was the place, as a patient coming in to see the doctors, you would give up your bodily fluids. Mom was a “pro” I guess at getting those fluids from you. 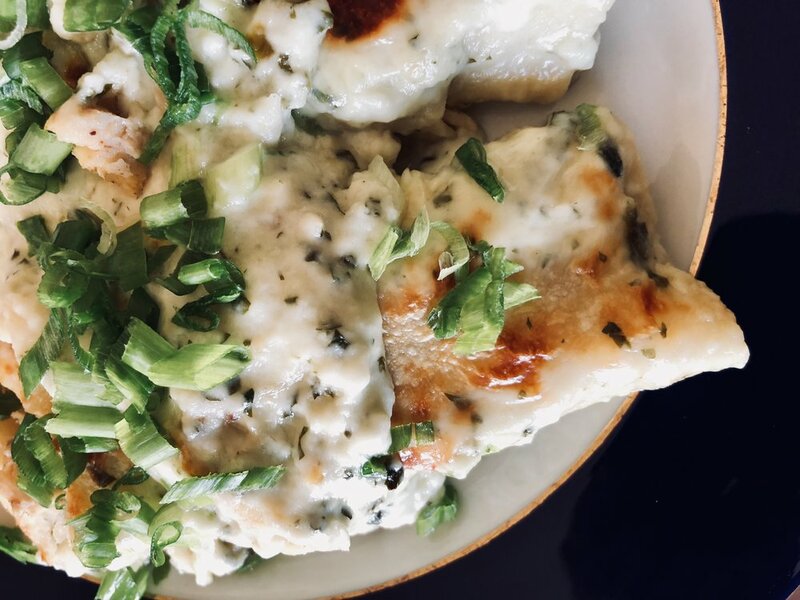 Whether it was with a cup and restroom visit, your arm at a forty-five-degree angle ready to have your blood drawn out, or even a cough and spit into a dish. One of the nurses would walk in with a thick manilla folder (they called it a “chart”. It was more of an overstuffed folder, with random paperwork flowing out), holding all the handwritten notes and diagnosis from the doctor throughout your years as a patient. Plop went the chart on the table next to truncates, cotton balls, and gulp….syringes. “Shorty…” (Mom at her tallest height was right at 5’0) The nurse would say while Mom was on her tippy toes looking down the microscope “Dr. Burnett needs blood drawn for rabies” or whatever blood was drawn for. Mom would spin around and hug or call the patient by name because she had been seeing them as patients for years…taking their fluids… and this was Sapulpa after all. Later from my Middle School years through college, and even culinary School, both Dr, Burnett, and Cale had eventually retired and sold the clinic to the local hospital or some medical group. and Dr.s Donald Johnson and Terrell Ramsey took over. Dr. Johnson was a tall stout red-headed man with a jolly personality and I believe was an M.E. Mom explained to me M.E. meant “medical examiner”, which translated to me as being Dr. Quincey from the TV show “Quincy”. He examined dead people and was a ladies man, so I thought Dr. Johnson was pretty cool. He also had a finger missing, the same finger most doctors needed to use for a prostate exam, and I always wondered how he got around that? Dr. Ramsey, I did not know as well, but he seemed to have the same calm demeanor his predecessor Dr. Cale had and seemed nice. Every other Thursday was Mom’s day off from the clinic, which meant every other Thursday my brother Ari and I could expect something delicious baked for us when we got home from school. There was either cookies or pies (Ask Ari about the chocolate Banana Pie “incident”), but typically some sort of cake awaited us. 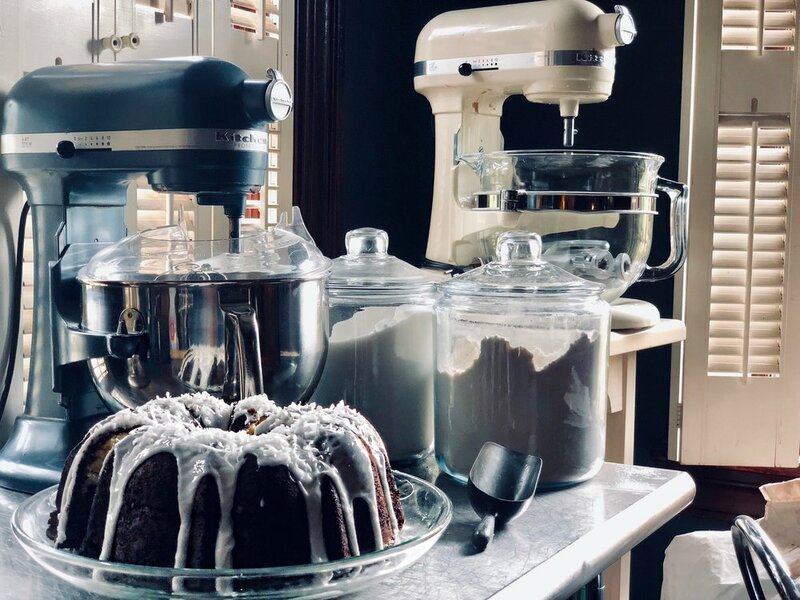 Mom was the real “Cake Boss” when it came to our home baking and it was always a surprise to see what inspiration she garnered from The Ladies Home Journal or one of the many collected fundraising cookbooks she’s purchased throughout the years. 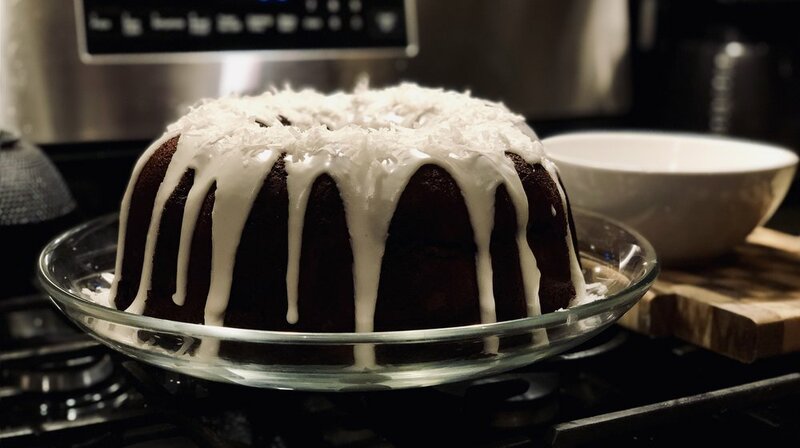 One of my favorite “mom cakes” was a chocolate bundt cake she made that had a coconut center running through it. I’m pretty sure this cake was a boxed cake mix that had the coconut center portion included. One of those 2-part cake mixes. When I asked about this cake a few years ago, Mom’s only response was “they don’t make it anymore.” So, of course, I have been pondering on how to recreate this cake. I set off to recreate Mom’s Chocolate and Coconut Tunnel Cake… And you know what? It turned out really well! The chocolate is super chocolatey and the coconut center had awesome flavor. 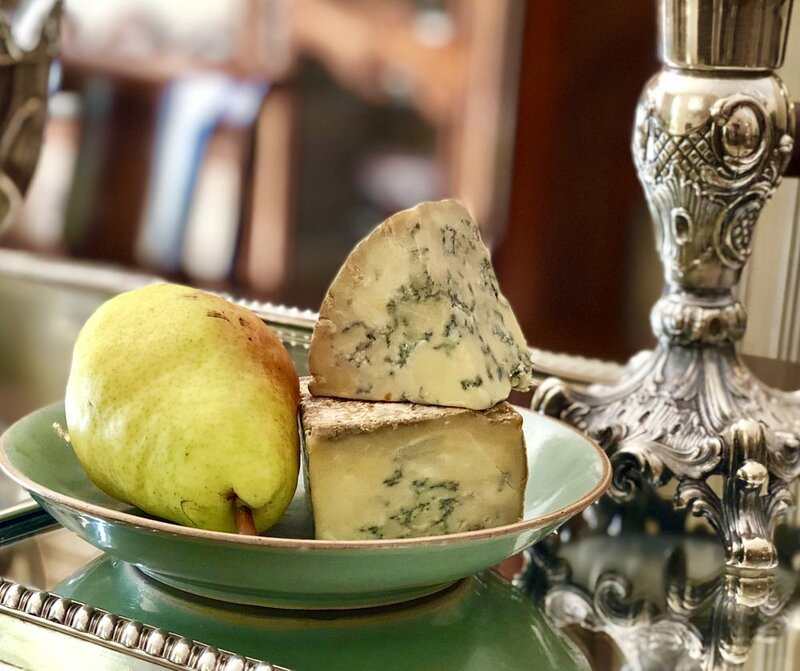 The color contrast and flavor contrast are on point… and well… it was a good reminder of much simpler days: Mom and her lab, the doctors and nurses, and that old clinic with Native American art, blue shag carpet, and reasons to leave bodily fluids with my mother. Adding string left over coffee from the morning. The coconut batter is heavier and will sink while baking, causing your tunnel to be at the top of each slice rather than in the center… like mine. Add 3/4 of the chocolate batter to the pan, then layer in the coconut. This will give a stronger foundation. I think. Preheat the oven to 350 degrees. Prepare a bundt pan by greasing the inside and dusting with cocoa powder. In a double boiler (with the water boiling) add the vegetable shortening along with the chopped chocolate and begin to melt. Remove from the heat once melted and let the mixture cool. In a small mixing bowl add the softened cream cheese, one egg, the 1/2 cup of sugar, 1 teaspoon of vanilla and 1/2 teaspoon of coconut extract. Mix completely until smooth. Add the 1 1/2 cup sweetened shredded coconut and fold in. Set aside. In a large mixing bowl combine the cake flour, 2 1/2 cups sugar, 1/2 cup cocoa powder, baking soda, and kosher salt. Mix with a spoon to combine evenly. To the cooled chocolate and shortening mixture add the 3 remains eggs and remaining teaspoon of vanilla. Add the 1 1 /2 cups of cold coffee and mix in completely. 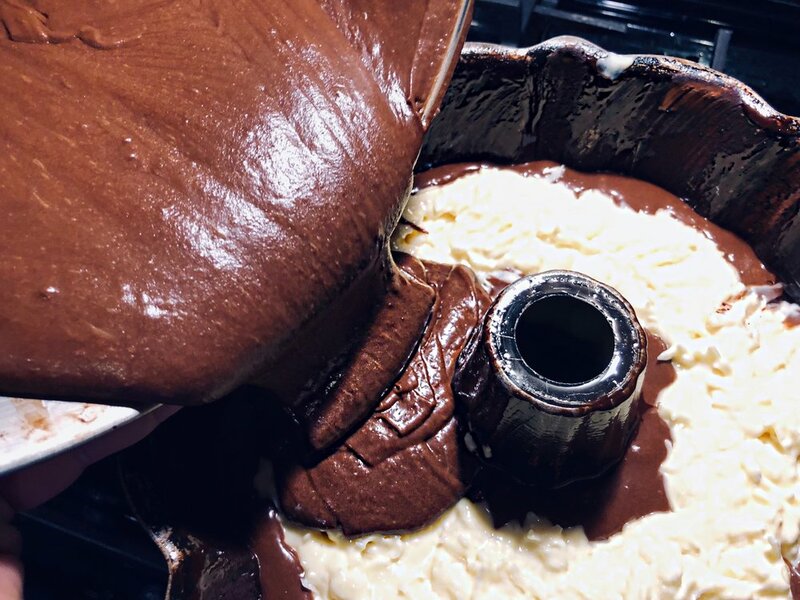 Pour the chocolate and coffee mixture into the dry mixture and mix to a smooth cake batter. 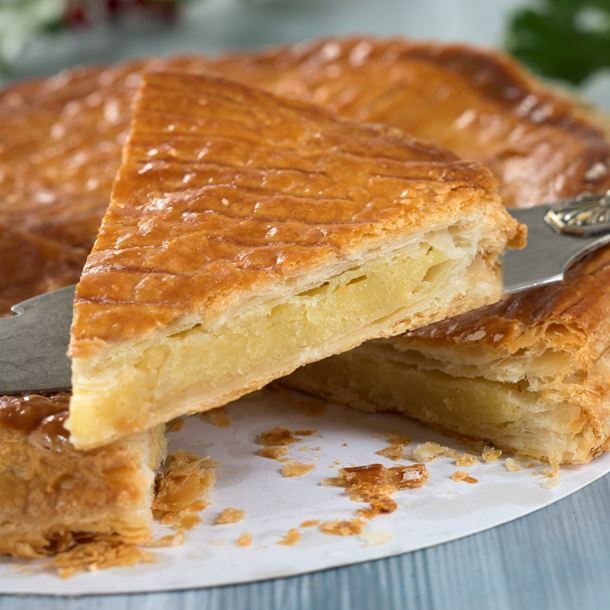 Place the cake in the center of the oven and bake for 1 hour to 1 hour 10 minutes or until your cake tester draws out clean. Remove the cake from the oven and cool in the pan for 15 minutes. Invert the cake out onto a serving plate to cool completely. Mix the confectioners sugar, milk, and almond extract into a thick icing. Spoon out the icing onto the top of the cake and let to flow down on the outside and inside of your bundt cake. Do this quickly because it will dry fast, and you still have shredded coconut to sprinkle on for garnish. Well, that’s the next step… sprinkle on the coconut and press into the icing gently. Add lots of drippy icing and flaked coconut on top! 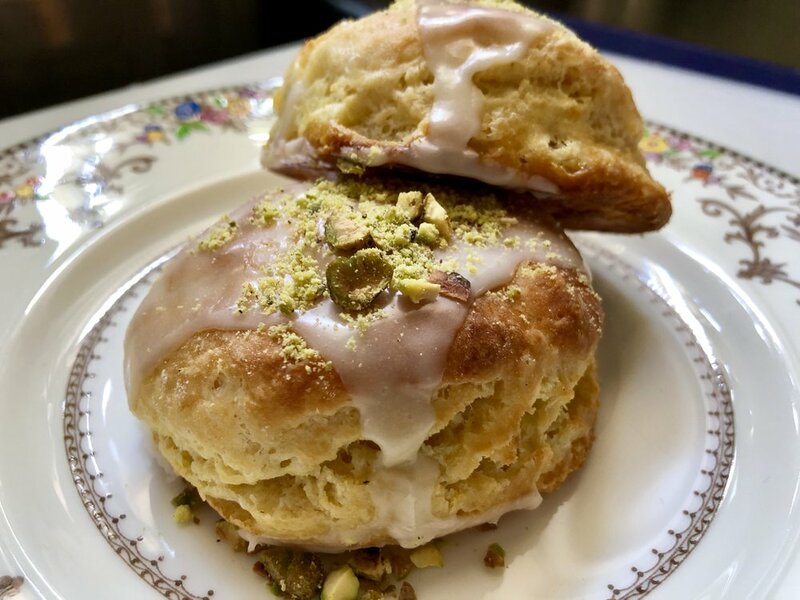 Once upon a time, my neighbor and an incredibly brilliant woman went to NYC on a foodies food tour… and just so happen to visit a cookie bakery that I absolutely love, Levain Bakery. One of the many reasons Christine Huckleberry is so brilliant is that she had the fore site and awareness to bring back a few of those cookies from that wonderful bakery and bring them home to me. Now I make no claim that this recipe is a Levain Bakery recipe. 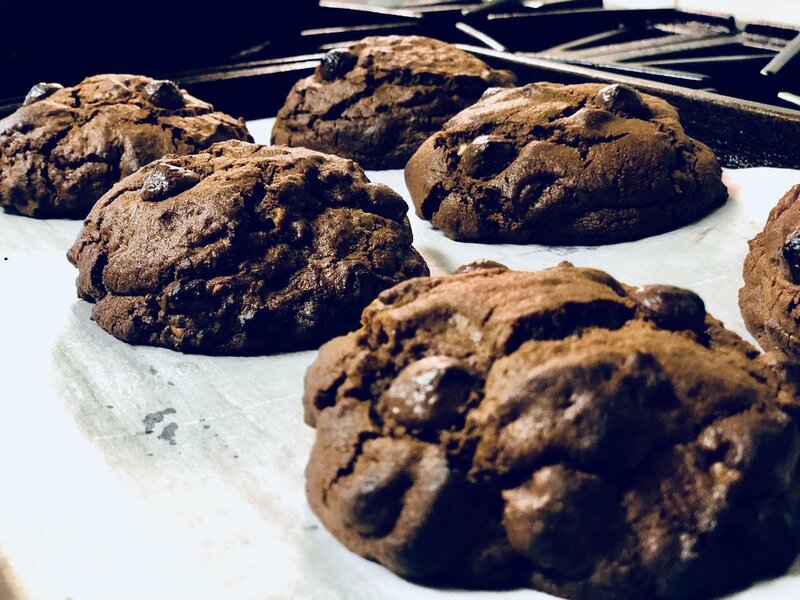 I do make the claim that I love their cookies so I did my best to squelch that desire of a thick, soft, rich, and flavorful cookie… by baking my own. It worked. If you’re craving a style of cookie such as this wonderful bakery then, by all means, help yourself to my recipe. You can also order their cookies online or simply visit the bakery. I’m a “NOW” kind of guy. 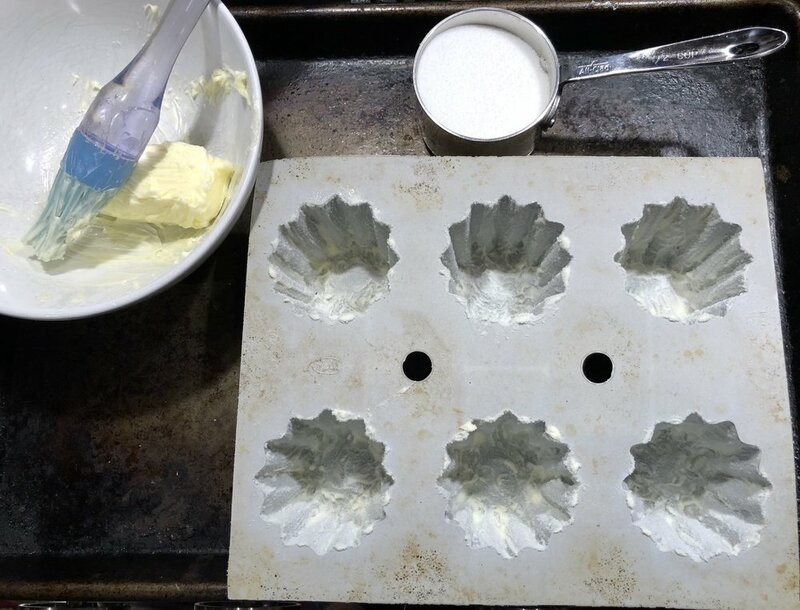 In a mixing bowl of your stand mixer or using a handheld mixer, beat the butter until smooth. Add the brown sugar and the granulated sugar. Beat until light and fluffy. In a separate bowl combine the dry ingredients: Both of the flours, cornstarch, baking soda, salt, espresso powder, and of course the cocoa powder. To the butter and sugar mixture and an egg, one at a time, and mix in until smooth. Scrape down your bowl, add and mix the dry ingredients in batches. After one batch is added mix just enough to combine, then add the next batch. It’s important to not over mix. With the last batch of dry ingredients added, scrape the bowl down and give the dough one good final mix. To the dough add the chocolate chips and the walnuts. With a wooden spoon, mix and fold in the “goods” until evenly combined. Prepare a baking sheet with either a Sil-Pat (Silicone baking mat) or parchment paper. With a large 3-ounce ice cream scoop, or balling the dough into the size of a large lemon, scoop the dough and place on the baking sheet. Whatever size of cooking baking sheet you use, keep space between each ball of dough. The cookies will be large, will not spread out that much, but you will still need at least 1”- 1.5” spacing. 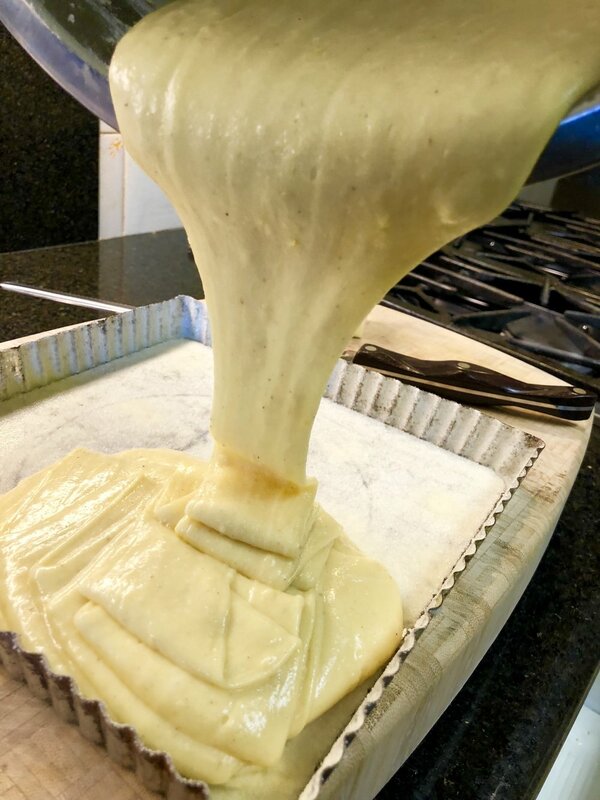 After you have scooped/balled the dough and place on the baking sheet, then place that baking sheet into the refrigerator to relax and “chill” for 15 minutes. Preheat your oven to 400 degrees. After 15 minutes place the cookies in the oven and bake 10 minutes and remove from the oven. They will seem undercooked at first, but wait until they have cooled .. and that's what you need to do. 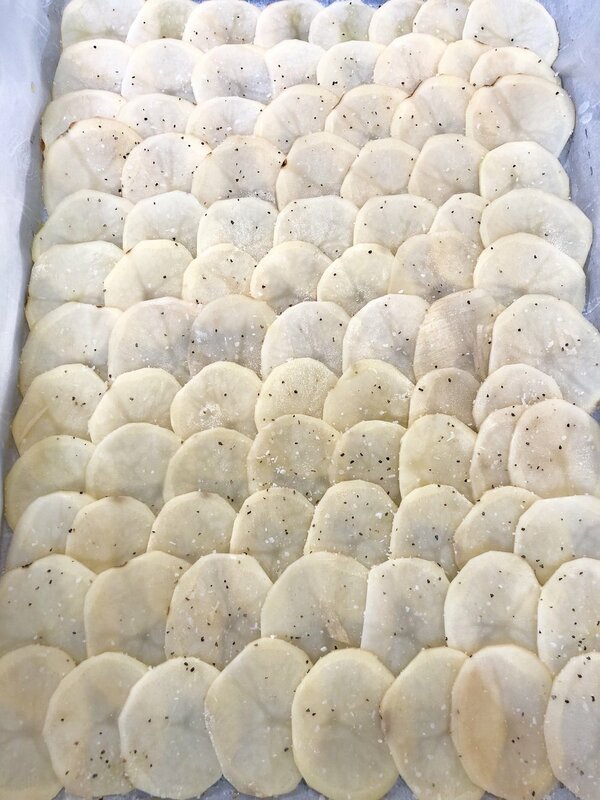 Let them cool before removing from the baking sheet. They are big and heavy and will break if not cooled completely. When you’re ready to eat one… I suggest a tall glass of ice cold milk. Seriously. Enjoy!! 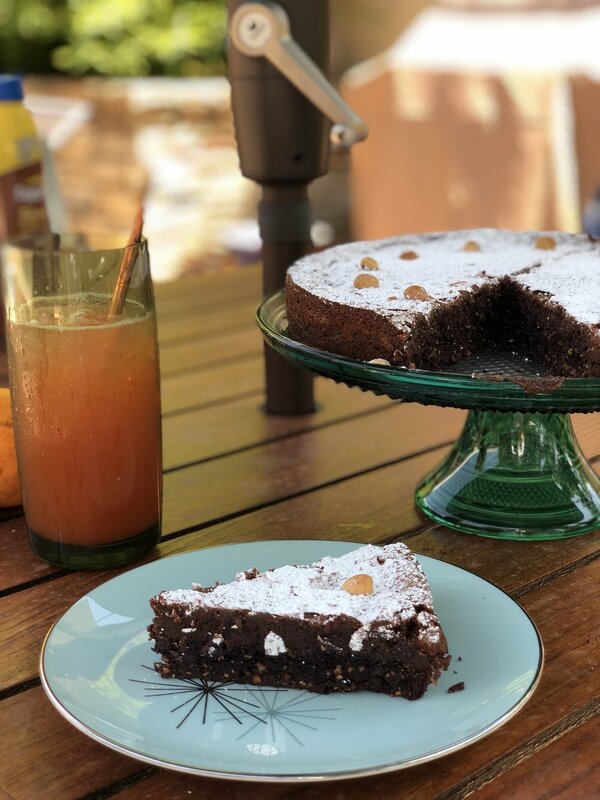 Because I’m not competent enough about the legalities of copyright infringement, trademark laws, and all that good stuff… I won’t mention the name of my favorite “candy bar” to whom this recipe is a catalyst for. Those of you familiar with candy bars can probably figure it out, but It sounds like “AllBand-Boy”. With that said… I had a dream about my favorite candy bar last night, which then got my creative juices flowing, and in turn this recipe. 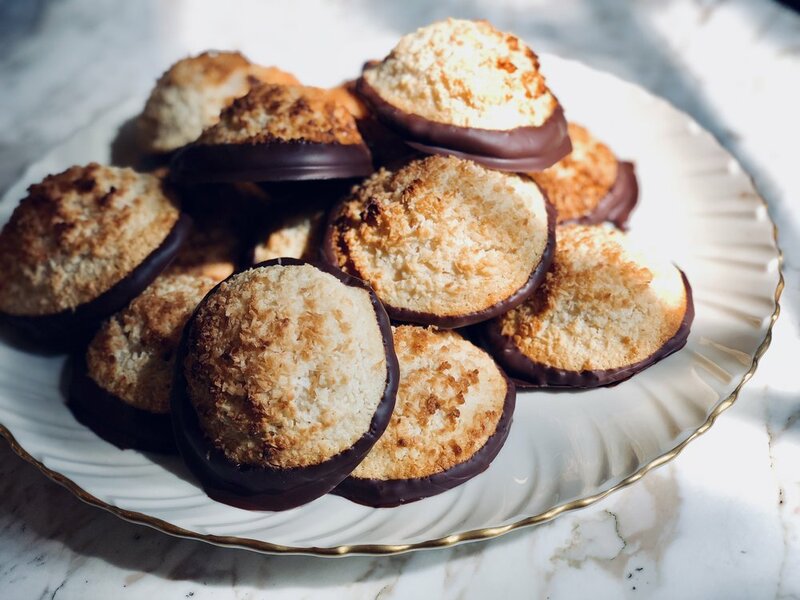 Now I am not claiming to come up with something earth-shattering as inserting an almond or two into the center of coconut macaroons, then dipping those coconut macaroons in chocolate, and claim brilliance. I am claiming that this idea may be new to you… as it is to me… and my excitement for you to try them knows no limits. “Chocolate Bottom” …. just cracks me up! A couple of observations when it comes to making these macaroons, and please keep in mind this is based on my taste and not yours. If your taste differs, then adjust your way. You do you. First, use unsweetened shredded coconut as opposed to the common sweetened shredded coconut found in all grocery stores. Why? The “Sweetened Condensed Milk” (Sweetened being the key word) makes the macaroons sweet enough. Now if you have a super sugar tooth, use the sweetened shredded coconut. 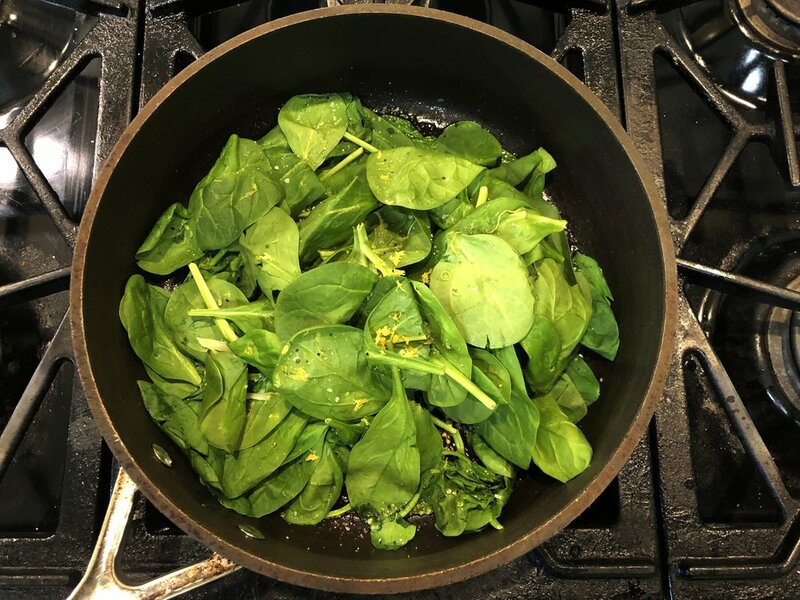 Second, as with all recipes from anyone not just with me, what works in my kitchen with my ingredients may not work with yours. I made these twice to get them the way I wanted them but both times the structure was off. One batch was more “loose” than the other. 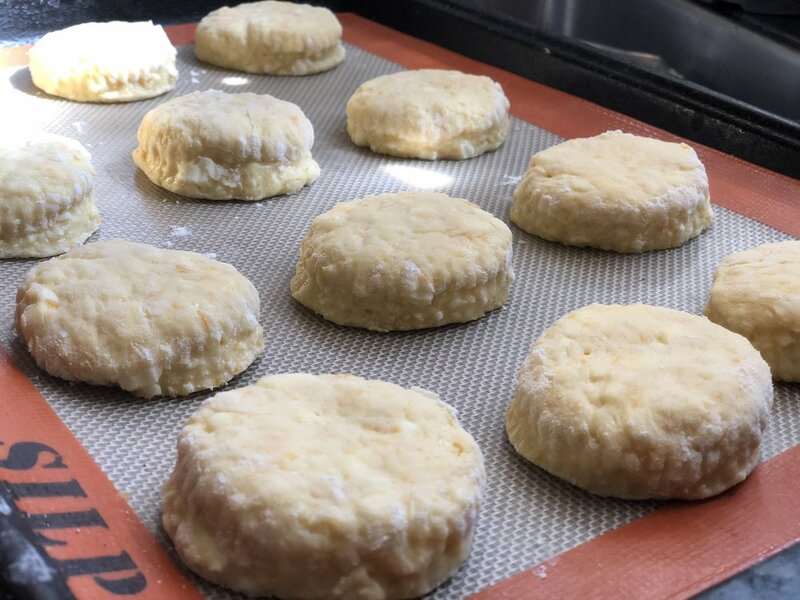 I suggest having a little extra shredded coconut and a little extra Sweetened Condensed Milk in case you need to tighten or loosen the macaroon mixture. I do however recommend chilling the mixture at least 20 minutes before scooping and baking. This chill time will help the mixture to set up and all those great flavors to meld. Ingredients: Makes around 15 2-ounce Macaroons. Unsweetened coconut added, ready to mix and scoop. Insert an almond or two! In a large mixing bowl with a wooden spoon or stiff rubber spatula at hand, add the two cans of sweetened condensed milk. Scrape out the cans clean… that condensed milk is luxurious! To that add the lightly beaten egg whites, vanilla extract, and almond extract. Mix in completely then add the salt. Mix again and scrape down the sides of the mixing bowl. Add the six cups of shredded coconut and begin folding it into the mixture. It won’t be like a “dough” so do not treat it as such. Just fold and mix until you have a nice thick coconut mass. Place the bowl into your fridge and allow it to chill at least 20 minutes. Preheat your oven to 350 degrees and prepare a baking sheet pan with either a Sil-Pat (silicone baking mat) or parchment paper. In a separate and smaller bowl add a cup or two of the extra shredded coconut. I used a 2-ounce ice cream/cookie dough scoop. They baked fairly largely… perfect size for me and mine, but maybe a little too large for others. If you’re baking these as “cookies” or for a gathering go down to a 3/4 scoop or 1 ounce. Scoop the macaroon mixture, scraping the bottom flush against the inside of the bowl. Insert an almond or two (your call) into the center of each scoop. Release the scoop into the smaller bowl of shredded coconut and coat the macaroon ball on all sides. Place the balled and coated macaroons onto the baking sheet as you would cookies. They will not spread much while baking but you do not want them touching. Place into the oven and bake 18-20 minutes or until the macaroons are golden brown. When baked, remove from the oven and cool. While your macaroons are cooling, melt the dark chocolate according to their directions. Mix until smooth and place into a shallow bowl. 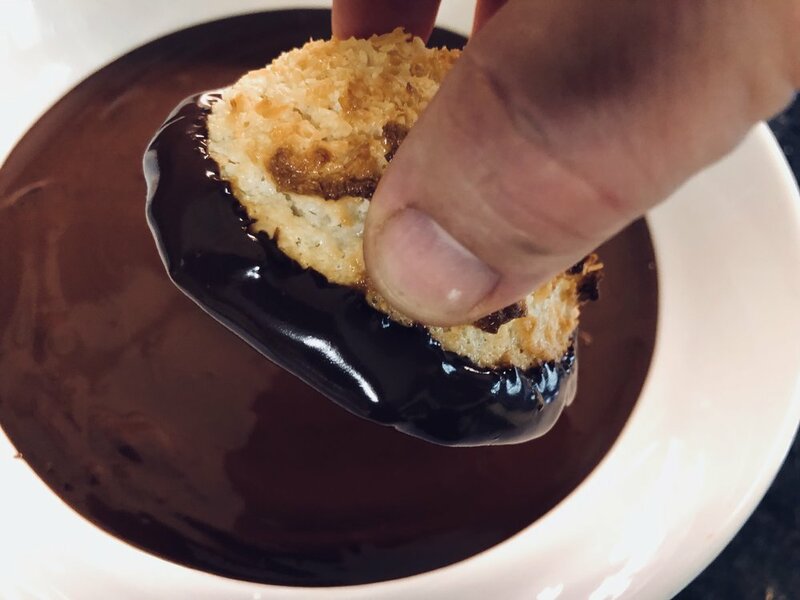 Dip the bottoms of the cooled macaroons into the melted chocolate just enough to coat the bottoms and rim the sides. Place the dipped macaroons onto a clean sheet of parchment and cool completely! Cooled enough that the chocolate has set up (I placed mine in the fridge for 20 minutes and they peeled off cleanly from the parchment paper). Serve your macaroons on a cool platter… remember, you’re dealing with chocolate bottoms. Okay, that made me laugh. Hey, Chocolate bottoms! Enjoy! 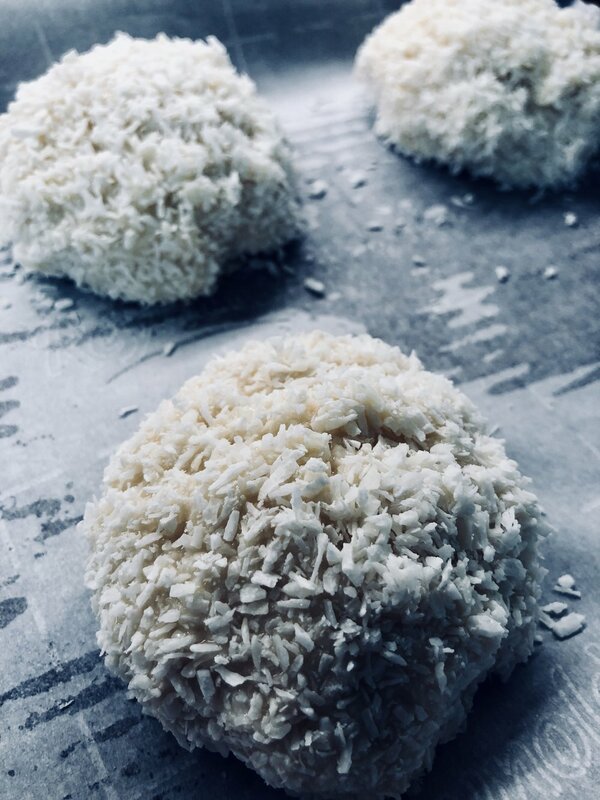 Macaroons are coated in extra coconut and ready for the oven.